snippets of the upcoming Dj T-1000 ep on AYCB. release january 9TH 2017! SUPPORT THE LABEL. THANK YOU FOR BUYING! early support from: jeroen search, pacou, dave clarke, dj deeon, tanith, marcel dettmann, modeselektor, basmooy, kyle geiger, boys noize, ascii disko, detroit techno militia, feadz, alexander kowalski, eclair fifi, norman nodge, truss, truncate, AYCB WISH A GOOD 2017 AYCB is proud to welcome DJ T-1000. the detroiter "wahlberliner" alan oldham is not just dj and producer, also a great illustrator, he made many of the legendary djax up beats artwork and just had exibitions in paris, amsterdam, detroit and berlin. musicaly 'distorter' is how the name said. distorted! a very forward bassline, straight kick with a dirty vocal supported from a tight hihat. banger! ray kajioka just released his new album on the famous berlin label kanzleramt last month. great album, great feedbacks - congrats! beetween all the interviews, he still had time to finnish a fantastic remix, more deep techno but still a bit jack. and housemeister? his version is more distorted. check also his latest ep released in december. amazing artwork by beeple releasedate is january 9th 2017. Buy DJ T - 1000 - Distorter snippets incl Ray Kajioka and Housemeister remix OUT NOW! Users who like DJ T - 1000 - Distorter snippets incl Ray Kajioka and Housemeister remix OUT NOW! Users who reposted DJ T - 1000 - Distorter snippets incl Ray Kajioka and Housemeister remix OUT NOW! Playlists containing DJ T - 1000 - Distorter snippets incl Ray Kajioka and Housemeister remix OUT NOW! 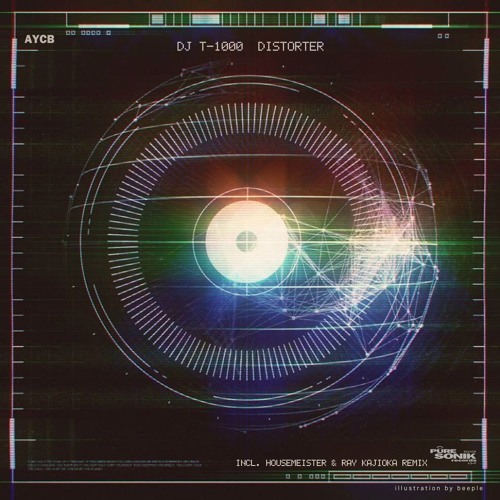 More tracks like DJ T - 1000 - Distorter snippets incl Ray Kajioka and Housemeister remix OUT NOW!